I’m not going to dwell on what makes someone an Elder. That is a discussion that many have already tackled. I’ve even addressed it in podcast a few times with both “old guard” and the newer generations of Pagans. Instead, I’ll address taking care of both the Elders and those who take care of them. Eventually all of us will grow old or become ill. With any luck we’ll be able to grow old and remain independent to our dying day. But let’s be realistic. That is not very common these days. My own grandmother , who was stubborn and independent to her last year of life, needed special care in her last days in this life. My tradition’s founding high priest was able to live at home until his health became such he needed round the clock care. When our Elders begin needing extra care it often falls to their families to provide such care. Sometimes that means non-Pagan family stepping up to the plate and bringing them home or putting them into a care facility. For obvious reasons this is not ideal. Their non-Pagan relatives may not understand their beliefs or simply do not care – either way their spiritual needs may not be met. Most care facilities are not equipped to handle the spiritual needs of Pagans, nor are they educated on those needs. Ideally, a Pagan relative or a member of the Elder’s faith path is able to step in and help address the spiritual needs of the individual. Even better is when they can provide both for their spiritual and physical well-being. All this, of course, does not address the emotional and mental health of the Elder. More on that later. It is scary when our Elders become “too” old or ill to care for themselves. It can leave us at a stand still to address our own spiritual needs, let alone their needs. When our Elders need special care for a healthy retirement we suddenly begin to see our own mortality. This forces us to re-evaluate our own needs, as well as the needs of our Elders. And that brings us to caring for the caregiver. Many of us with parents over the age of 60 have already thought about how we’ll take care of them if they need special care. Everything from moving them in with us to specialized care facilities and everything in between. My own mother is living a community for the elderly and disabled. She retired some years back and returned to her home town in rural Colorado. I’m fully prepared to pull up stakes and move closer if and when the time comes that she needs 24 hour care. Lucky for both her and I, she has plenty of family in the area to help take care of her. Even with her having people in town to help care for her I have felt first hand some of what caregivers experience when their charge is ill. Before she retired, I wound up – happily – taking care of her after she broke her ankle. Driving her to and from doctors’ appointments, doing her shopping, and even helping her bath and dress. This just happened to be during the time I had been laid off from a job, so there were no scheduling issues to contend with. After her retirement and moving back to Colorado, she had double knee replacement. While in recovery she had blood clots in her lungs. I was scrambling to figure out how I’d be able to rush to Colorado to take care of her and nearly had a stroke myself. That is when I realized that I wouldn’t do her, or anyone else, any good if I wasn’t taking care of myself, too. Who does take care of the caregiver? That is a question often left unanswered in this or any other community. Kind of like the idea of “physician heal thyself.” Much easier said than done. My HPS is a drug and alcohol rehab counselor. She spends every day of her work week listening to the problems of her clients, helping them to overcome hurdles and lifting them up when the slide down on their path. Though she does not have a drug or alcohol problem, who does she turn to when she needs someone who does understand what she is going through? My HP works with the Native American population. He spends a good amount of his time addressing their needs as well as the needs of our tradition members. Who makes him pause and take care of himself? A good friend of mine does energy healing, both hands-on and long distance. Who does the energy work on her when her knees are throbbing or she has a migraine? I’m frequently the ear and shoulder for my HPS. I know others are as well, but being several hundred miles removed from her and the majority of our trad mates makes it easier for me to give an “un-involved” take on whatever situation may be causing her stress. More often than not, our HPS is the one that makes our HP take a break. Sometimes lulling him to sleep, making a home cooked meal or just taking him away from everything for a few hours or days. My friend who does energy work? Well, unfortunately she is on her own in that department. Every time I try to do energy work on her it backfires and makes things worse. I do remind her to channel that energy, the pain she has taken from someone, into something else. Something that can be destroyed or buried or transmuted into something positive. Not only has my own tradition suffered the loss of a leader, an Elder, in recent years. The same year that Lord Balor passed the founding high priest of a local Wiccan Church also died. His partner needed special consideration and care in dealing with the grief of losing him. Though they were not legally married, she still had the pain and confusion that a legal spouse would suffer. To make matters worse, his blood family refused to follow his wishes when it came to his funeral arrangements – boxing his remains up and sending them half way across the country to be buried in a Christian service in Virginia. His ex-wife, who is leader of the church, was one of the first to step forward and comfort his widow. The church and many friends and chosen family banded together to meet his requests for a memorial service as well as to take care of his widow. I attended his memorial service. It was a touching event. The room was full of people who knew him and loved him. At the request of my HPS I conveyed the condolences of her and the other members of our tradition. The Wiccan church and its membership returned those words to us when had the memorial service for Lord Balor. When Balor was sick and it had become evident that he would not be long for this world, our family joined together to do whatever we could to not only make his last weeks comfortable, but to make things as easy on the household and the tradition as possible. One of our members, who lived with him and many other members of our trad, was at his side night and day. He is still kicking himself for not being in the room at the final moments. Balor and many others in the family had convinced him to take a break and get some rest. It has been nearly three years and he is still not over the guilt, no matter what we do or say to show him that it was alright. Actually, there should never be a single caregiver. This may seem blunt, but I am very firm in my belief that when someone is dying there should be a team of people who help take care of their needs. No one person can do it alone, nor should they have to. Even when there is a great distance between the loved one who is ill and the rest of his or her family, a support team can be built. Take a look at my own family’s experience. Henry C. Kessler, Jr – RevKess’s father. Photo circa 1984. When my father was dying he was shipped off to Richmond, VA by the Veterans Association. They told us that the hospital in Richmond could take better care of him than the VA facilities in our area. That was a devastating experience for all of us. My mother was distraught and depressed while he was away, even more so after he died in Richmond. We were blessed to have such a large family in the area to help take care of her and what needed to be done to keep things running smoothly in our household. One of my older brothers moved his family across the alley from our house, both of my sisters were living in the area at the time and took as much time as possible to be with us, especially with my mother. Truly amazing to think about. My mother is their step-mother. The day that he died my mother and my eldest sister were making arrangements to fly to Virginia to be with him, calling on various family members to be available to take care of my brother and I (he was 13, I was 8). Then the phone call came. It was too late. I don’t know what my mother did when she heard those words. I was at school. I do remember hearing the page over the intercom system in my elementary school telling me to report to the principal’s office. I didn’t wait long. My other sister and her boyfriend picked me up. My 13-year-old brother was also being picked up, the high school was across the parking lot. We road home in silence. My sister’s face was red and puffy, it was obvious she had been crying. Her boyfriend was stoic. My brother’s face was blank, tear streaked. No one told me what was going on, but I knew. We got to the house and everyone was there. All five of my half siblings, several cousins, aunts, uncles. I’d never seen that many people in my house before. My great-aunt took me into my room and sat me done on the bed to tell me that Dad had died. It wasn’t just family that gathered together to help take care of us, to lend a hand for my mother when she needed a break, to make sure that we were fed. Church friends, co-workers, neighbors. An entire community, a village, turned out to take care of whatever we might need. It was almost overwhelming for Mom. People from church volunteered to drive my brother and I to and from school so we wouldn’t have to ride the bus right away after his passing. The entire second grade sent sympathy cards through my home room teacher who attended the funeral, Dad had volunteered at the school before he got too ill. The high school principal also attended. Our minister from Colorado came up to conduct the funeral. Three ministers conducted the service at the church. The pastor of that congregation, our pastor from Colorado and a third who signed the service for the deaf members of our church family. After it was all over with. The church service, the graveside service, the support did not go away. We had become even closer to those within our church family who had made themselves available to us. Mom realized that she had true friends at work, people who were more than willing to go that extra mile to take care of things. My brother and I suddenly had a posse of people who willing to step into the role of surrogate parent while our Mom grieved and faced her own frailty. The saying goes that “it takes a village to raise a child.” It also takes a village to care for someone in need. I’ve given many examples of the love and tenderness shown by friends and family, by community and neighbors, when someone is dying. These are only examples. I’m not aware of any care facilities that are specifically Pagan. In my area there are few that are even aware of the need for such facilities. For the few in the Midwest that may be in need of such care facilities I can only hope that they have a community that is available to visit and administer to their spiritual needs. As a child and a young adult I spent many of my years in nursing care facilities. My mother worked at one in small town Colorado until we moved to Nebraska and again some years later until her retirement. I learned how to walk pushing wheelchairs and had many “aunts” and “uncles” as a young child. I even worked for four facilities in my late teens and early twenties, including the same one as my mother. In three of them I worked in the kitchen, the fourth I was a nurse aid. I enjoyed the one on one interaction with the residents and even went to school to better meet their mental and emotional needs. Seeing how people in care facilities are taken care of, or sometimes mistreated, has given me a better understanding of what it might be like for our elders as they approach a time where such facilities may be necessary for their continued health and well-being. The stories of abuse are few and far between. In all my years working in care facilities the closest I saw to abuse off a resident was neglect – serious enough – but no verbal or physical abuse. If does happen, just not as often as the media likes to make it appear. Larger cities with bigger Pagan communities may have more opportunities to form care groups or even facilities to care for our elders. I’ve not seen that happen yet. There have been a number of elders over the last half-dozen years that could have benefited from such care groups. Many of those were lucky to have spiritual families that could and did step up to the plate to take o them. There have been some, however, that were left with no choice but to face the end of their days without that kind of care. I do think that part of the problem, for it is a problem, is that as Pagans we don’t know how to go about forming these groups. Clearly, as a whole, we do not have the means to build facilities for our elders. We may have doctors and lawyers and such within in the broader Pagan world, but that doesn’t mean that we have funds nor the infrastructure to create what is needed for our ever-growing population of elderly and disabled members. We can crowd-source building projects to house our history and fund the production of new art and music, but creating something like a Pagan Nursing Home is not happening for us. It would be nice to say that tomorrow we could start a project to raise funds to build such facilities across the United States and similar projects around the world. It just ain’t happening. What can happen is the creation of resource groups to help those who are caring for elders. Many nurses, doctors, psychologist, cooks, and companions exist in our not-so-little community. They may be scattered across the globe, but they can gather together in various ways – notably on the interwebs – to share ideas, give advice, even counsel each other when the need arises. This is the solution. Perhaps there isn’t really a solution. But it would be a start. There are groups popping up almost every day on Facebook and elsewhere for other kinds of networking. Why not a networking group on some social media site or another for just this idea!? There are groups for Pagan parenting, how difficult would it be to create a group online for caring for our Pagan elders? Not very. Someone should do it. I might even do it. But that still doesn’t address taking care of the caregiver. Maybe such a group would also have the support built-in for those who are the caregivers. Support and help for the caregiver is essential for that person to be able to give proper care and support for those in their charge. I know, that sounds like it is a job, a must-do duty. In a way it is. A duty, that is. Our elders have spent years, even decades, supporting their communities and their covens/groves/circles/whathaveyou. They deserve the respect and honor that taking care of them in their time of need entails. I know many priests and priestesses, teachers and healers who have sacrificed of themselves to help and support their students and “congregants” in their time of need. Is it too much to ask that those who take care of them look at it as an honor to do so? And is it too much to ask that the caregiver is given the same kind of respect and consideration that our elders are worthy of as well? No. I’ve sacrificed sleep, going out with friends, and spending time for self-care so that I could help take care of someone in need. I’ve done it to the point where I have made myself sick. I don’t regret any of it. When my mother needed me to take care of her after her accident, I felt honor bound to do so. I felt that it was what I should do. She had taken care of me in my times of need. It was my turn to do the same. When my tradition patriarch was sick and dying, I did whatever I could to be with him. Being hundreds of miles away made it so that I couldn’t be there at the end, but I was on the phone regularly with his caregivers. I spent as much time as I could with him whenever I was able to make that trip. I only wish that I could have been of more support to those who took care of him. You are the one. You are the one who some day may be called upon to take care of an elder. To take care of a loved one, a family member or friend. Some day you may be the one who needs that care. Are you ready? Are you willing? Are you able to make the sacrifices that entails? You may never know until the situation arises. You can hope that you are ready, willing and able. You can also hope that you will have the support network in place to help take care of you as you administer to the needs of the elder. I’m going to touch on something here that is hotly debated within the Pagan community. The idea of paid clergy, of paid members of our spiritual society. The idea that someone, or a group of someones, are professionally trained and have the abilities needed to administer to the needs of our community. Other spiritual societies have paid clergy, even if they are only given a small stipend and a place to call home. Pagans are resistant to that concept. It smacks of us needing an intermediary between ourselves and the Gods. That’s not what I am talking about here. I’m talking about people who are trained to give the specialized care that an elder may need. Medical and nursing care, emotional psychological care, as well as the spiritual care that they need. There is a title for such a person. A death doula. A death midwife. The concept of someone who helps bring a life into this world is readily embraced by most everyone in our cultures. The midwife, or the doula is respected and embraced by many Pagans and non-Pagans alike. But a death doula, a death midwife, is something that frightens us. Death frightens us. Which is odd, to say the least. Many Pagan traditions embrace the idea of reincarnation. The idea that this life is not the only one we get. So why do we fear death? I cannot answer that here. I’ve already rambled on long enough. I can say that the fear of death in modern Western society is a relatively new concept. Death is natural. It is unavoidable. It is what we leave behind that matters – as well as how we lead our lives. 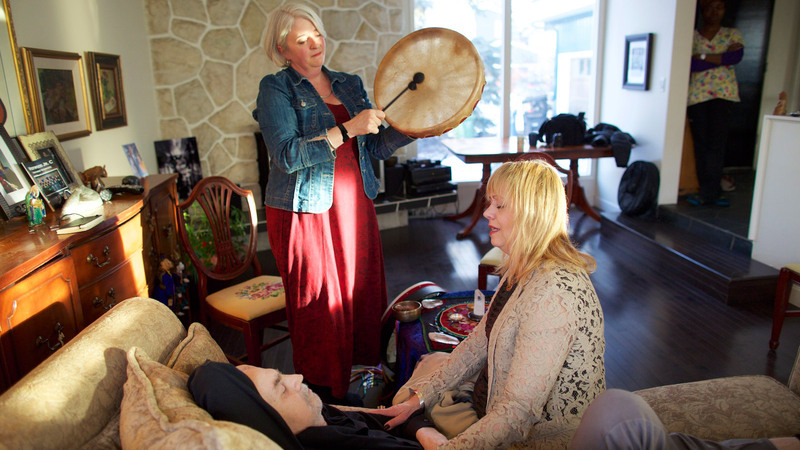 A death doula is someone who is in a position to de-mystify death. Someone who can help comfort the dying, as well as the loved ones who are taking care of them. A death doula’s position is something relatively new to our modern society. It is something that I hope to see continue and grow within many Pagan traditions. One of my tradition brothers is exploring the concept. My sister-in-law has been an unofficial death doula to many. My great-uncle and great-aunt were lucky to have a death doula, also called a mourning doula, to take care of them in their final years. She was a hospice caregiver, but she had training in death midwifery. This new idea to the modern Pagan world may lead to a better support network for our caregivers. In a way, they also help to take care of the caregiver. your HPs should have a professional network behind her, that is the responsibility of the employer and the professionals involved. Re: Older care. Not enough geriontrics is done in the community and personal level … but for many of us, they are the generation who had practical jobs and set up the toxic environment that we struggled through – and that our grandkids are being left impossible bills for. Everything from bad corporate science, insane government nanny state. they had very open markets, access to plentiful raw resources, cheap prices and a small population. They set up pension schemes and currency systems that are “money for us today, and pass the cost to later”. Re: Elder (vs Older) care. Why the celebrity culture? Why do BNP get more? My Great Grandparents did far more for our family than ever a BNP or government did… yet the systems at the time insisted they pay medical professionals to keep in horrible hospital rooms and be tortured until they died, while the professionals lined their pockets at our familes expense. Why should “pagan elders” get it better than everyday pagans? 1. My HPS does have the support of the clinic that she works for. But how many clinics do you know of that are capable of dealing with whatever issues a member of the clergy may have? Especially secular clinics. Its not like we are talking about Catholic or Lutheran Social Services. 2. You seem to have an issue with those who have come before. Not everyone who is a baby boomer or older worked a job with a pension or was able to sock away a retirement fund. I doubt many had a 401k option either. 3. I believe you misunderstood the use of “Elder”. I use “Elder” out of respect. Anyone who has earned that title in their community deserves the respect of having it capitalized. The only mention I made of “BNP’s” was in my opening. After that, every Elder I wrote about, either specifically or generally, was your “everyday Pagan” who had earned that title and the respect that goes along with it. This article moved me greatly. It was well written and touched on a subject close to my heart. I enjoyed reading it. I am an STNA(State Tested Nurses Aide) here in Lakewood,Ohio. I am openly pagan and have been for most of my life. I had an experience 9 years ago where I watched helpless as one of my spiritual teachers passed away suddenly and his family disregarded his last wishes. He was given a devout Christian funeral because that was what his sister insisted upon(whom I had never met in the 20 years I had known him…until he passed away). I will never forget the feeling as I stood in the back of the room and listened to the preacher (who never met my teacher/friend) deliver his eulogy. Later that same night, all of his pagan friends gathered for a separate ceremony in his honor and I was blessed to be chosen to speak for him there. I work for a home/care facility that offers a lot of options for religious support to our residents, but only in the “traditionally recognized” faiths. I have long wanted to work for a home that was open to our faith/path, but none seem to exist here…or if they do, they do not advertise. I would be very interested in providing professional healthcare and support to elders in need of care and their families. Any advice on how to go about making myself available in that area? I am generally solitary these days, as both of my teachers/mentors(my other teacher was a shaman who passed away 5 years ago from a terminal illness) have now passed on and the groups we associated with have slowly dissipated, and so I do not have a lot of connections in this locality. Is there a way to get the word out about what I have to offer as a caregiver to elders/pagans? Any advice would be greatly appreciated. Reblogged this on Lair of the Red Dragon. Thank you for re-posting…our hearts are heavy but the work goes on…in honor of those who have moved on!